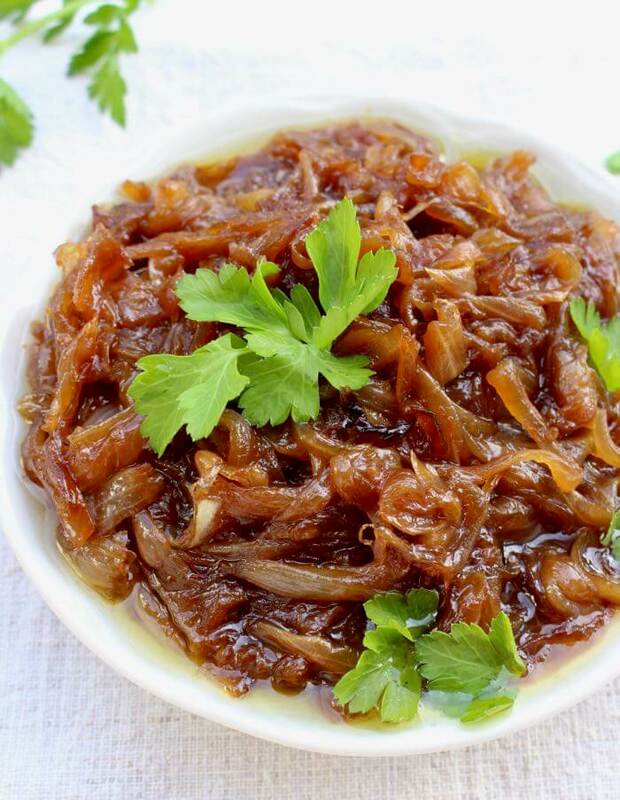 A simple guide on how to caramelize onions at home with wine, beer or balsamic vinegar. Honey is optional but it adds a nice sweetness I love. I’ve been practicing how to caramelize onions, can you smell the goodness from over there ? And before we talk about this, can you believe it’s almost Christmas ? I feel so unprepared I am looking for a legal way to push it back a few months. Instead of my Italian wedding cookies I am baking pizzas and perfecting the art of caramelized onions! So let’s party, right ?! 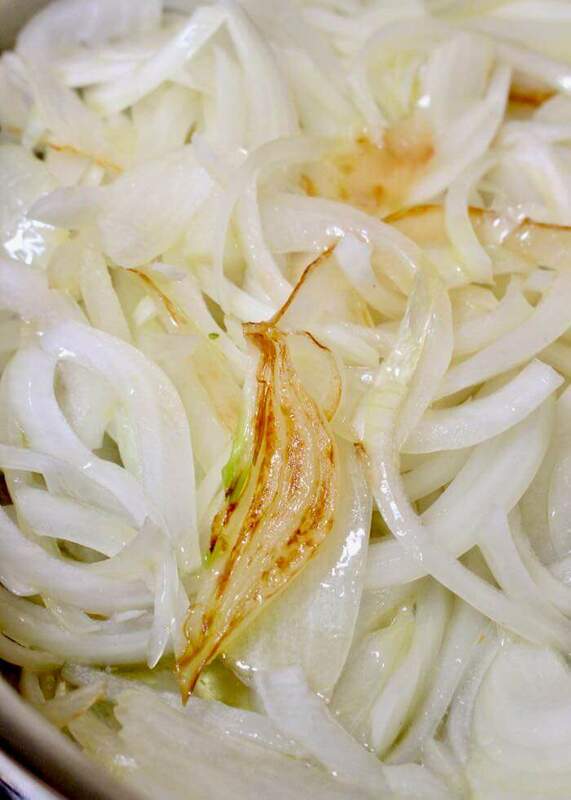 You can caramelize your onions with olive oil or butter, whatever rocks your taste buds! I really prefer to caramelize onions in a healthy way, without burning them, so I start with a little bit of olive oil and little splashes of water in between to help the slow cooking method along. That is the basic simple way. 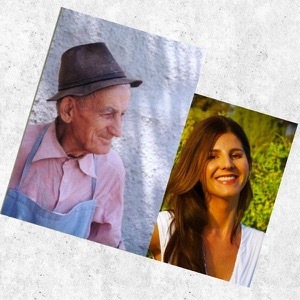 If using balsamic vinegar refrain from adding it to the dish until the very end. Weather you want to learn how to caramelize onions for pizza, burgers or steak, the process is the same. You will need patience and to keep a close eye on your pan. 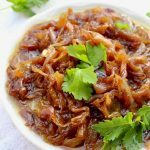 Caramelized onions are are also the base for the famous French Onion Soup, great as a side dish or on a bruschetta topped with scrambled eggs. Divine! 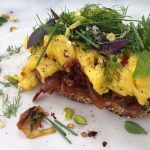 In reality onions contain a lot of natural sugars, so If done right you won’t need to add any honey or sugar at all to help with the caramelization process. 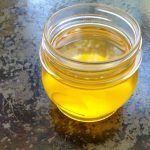 I love the taste of honey, so you will see some of it in my recipe, but it is an optional step. 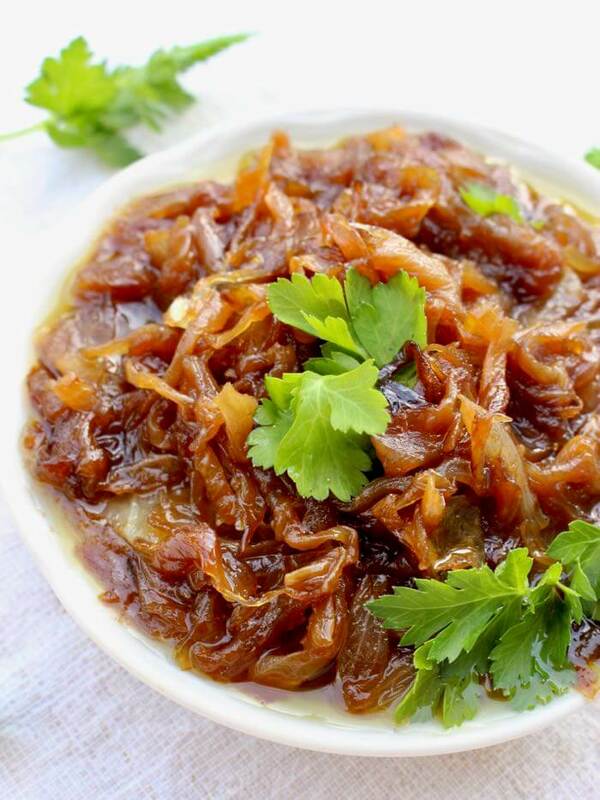 A simple guide on how to caramelize onions at home with wine, beer or balsamic vinegar. Heat up the olive oil in a large heavy skillet on medium low flame. Add the sliced onions and toss to coat. Add the sea salt and let them sweat slowly. The salt will bring out the water from the onions and once that evaporates they will start to caramelized. Make sure to keep an eye on them and stir as soon as they start to stick to the bottom of the pan. About 30 minutes later add the honey if using to help with the caramelization process even more. Add a splash of water to deglaze the pan and intensify the caramelized flavor. Repeat this process as many times as desired allowing the liquid to reduce completely before removing the onions from the flame. I get the perfect caramelization in about 1 hour to 1 hour and 15 minutes. The onions are done when they are completely softened and have a brown golden color. If using wine, balsamic vinegar or beer to deglaze the pan, make sure to wait until the very end and allow the liquid to reduce as much as possible without drying out the caramelized onions. A silicone spatula is perfect for stirring and deglazing the pan. Merry Christmas Rebecca! Enjoy the Holidays! Believe it or not, you don’t need to add any sugar. Caramelizing, or cooking slow, brings out the natural sweetness of this vegetable.